Since this is a two-episode recap, I mulled over what image to use to head the post. Should it be one of Eun-sung and Hwan sharing an awkward but sweet moment? That would be the natural thing to do. But watching these two episodes, the main thing that struck me was how the relationship dynamics were shifting. Episode 16 is key because it is here that the two guys become aware of how the other feels about Eun-sung. This post will thus be different from the previous recaps because I want to focus on the characters and their interplay with each other. What has been great about the drama so far is that despite its general tone of lightheartedness, its characters aren’t shallow. They are multi-faceted and they evolve, surprising us in the process. I will begin with Jun-se because he is the first main character to declare his feelings and because that declaration becomes the catalyst for some major developments. JUN-SE: I want to be honest with you. After refusing his father’s request to join Jin Sung Food, Jun-se hasn’t been his usual self. And indeed Eun-sung finds Jun-se deep in thought on the balcony of the second storey. He does not even turn around to look at her when she asks him if he’s really upset. “Yeah,” he says, still gazing into the distance. You can make me feel better, Jun-se says. Let’s go out. What we see next is Jun-se at his most playful. I keep replaying this scene because something tells me this will be the last time in the drama that we see Jun-se this happy. Cycling with Eun-sung, racing with her in that devil-may-care way, the two egging each other on and laughing with such abundance, the chemistry they share is so comfy any bystander will assume they are a couple. But Eun-sung’s glee on this day also made me uncomfortable at first. Eun-woo is missing! Shouldn’t you spend every free moment searching for him, instead of depending on Grandma Jang and her hired sleuths who aren’t related to him and thus feel less urgency? How can you be this gleeful? Still, how do I know she isn’t crying in the quiet of her room, the pain of missing her brother a festering wound? And if she isn’t crying anymore because she has already shed a lifetime’s worth of tears, isn’t that okay, too? Why the nonstop grieving if it accomplishes only a numbing weariness? So go ahead and laugh, Eun-sung! Is their shared joy the reason Jun-se decides at the end of Episode 15 to profess his feelings to Eun-sung? Or is it partly because he receives, midway in the episode, a marriage proposal? Long before I watched Brilliant Legacy, I read a synopsis that described Jun-se and Jung as engaged. So throughout the first few episodes, I thought it strange that he should be openly interested in Eun-sung. You’ve been taken off the market, so why are you still behaving like you’re an available catch? Now I realize that synopsis was wrong: Jun-se and Jung were never an item. Everyone is delighted, including Grandma and Hwan. The former because she’ll be able to depart this world in peace if her Jung is wedded to steadfast Jun-se. Hwan because… Ah, I’ll share the reason later. Jung immediately shifts into housemaid gear, looking every bit the part and shocking our not-easily-shocked butler by her “What household chores do you want me to do today? Mow the lawn? Strip-paint and re-wallpaper the whole house and the neighbors’ as well?” Well, not exactly, but our starry-eyed bride has discovered a new goal: to be worthy of her new husband. Only problem is… her intended husband has already drawn up his plans and they do NOT include her. Confronted by a proposal he never saw coming, Jun-se tells Jung’s mom with gentleness and unmistakable seriousness: Jung is like a younger sister to me. There is someone I like. A woman I like very much. Isn’t it quirky that of all the people in the drama, Jung’s airhead of a mom is the first person to hear what Jun-se has guarded in his heart all this while? But don’t begrudge her because our ajumma’s acting is amazing in these two episodes. A lioness defending her cub can’t afford silly antics and our widow shows she’s made of sterner stuff. Remember I asked in my last recap when Hwan’s mom would grow up? I believe we get our answer in Episode 16. After that pronouncement that there’s a woman he likes, Jun-se decides it’s time to let the woman herself know his feelings. No matter the ending of the drama for Jun-se (and I’m not optimistic), the next scene will always be one of my favorites. Eun-sung and Jun-se in the kitchen, like two chefs who have been buddies a long time, like a couple on a weekend, bantering and cooking away. As they take a walk after dinner, Eun-sung reminisces about the past. To cook in that way, to share such companionship… Was it such a long time ago that she had been happy? As she talks, Jun-se listens carefully. And then he speaks. It’s not too late. You can be as happy now as you were in the past. I want you to be like the Eun-sung that I first met, full of hopes and dreams, a luminous Eun-sung. Cooking, creating new dishes, living simply. I don’t want to be like a brother to you anymore. I want to be your man. Perhaps the most heartfelt words he has ever spoken to anyone. Words that make my heart stop (not from sheer envy, I swear!) because I can anticipate Eun-sung’s response and I can’t bear to see how that will affect our Jun-se who’s standing there with such hope in his (beautiful) eyes. But before I talk about Eun-sung’s reply to Jun-se, let’s look at the tumult in Jung’s house. Her mom has returned, bearing the bad news. Unwilling to believe her ears, Jung hops into a cab to go to Jun-se’s office but learns he has just left for home. Rushing there, she arrives just as Jun-se and Eun-sung are walking happily into the apartment block. GRANDMA: All my life I wanted to do the right thing. 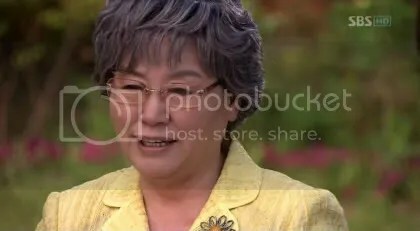 Connecting the dots, Jung realizes Eun-sung is that woman whom Jun-se likes. Her Jun-se, the one who wiped her tears at her father’s funeral, the one she had always assumed she would marry. Not only is she losing him, but to lose him to Eun-sung? I used to regard Jung and her mom as a comic act, but now I’m really enjoying them. On learning about Jun-se’s feelings for Eun-sung, Jung wails in anger and disbelief. (To have years of hope cruelly dashed in one day is a kind of dying, isn’t it?) Of course she bounces back faster than most people, which makes me suspect she has more backbone than she has let on so far. Either that or she’s queen of farce. Jung’s mom is also a sight to behold; we have never seen her this upset. Such a good catch, this Jun-se, and he fell into Eun-sung’s net? NO!! Your very own granddaughter is dying! It’s your fault for bringing Eun-sung into our home. Who is she to take everything away from my children, to make them suffer so? What did we owe her in our previous lives? Grandma’s reply? “Since a long time ago I expected that Jun-se would marry our Jung. It’s a pity things have turned out this way.” And then, as though a certain witch has cast a spell on her, she proceeds to treat Eun-sung like an unwelcomed guest in the house. She doesn’t smile at her; she dismisses Eun-sung’s words as if they are the irritating buzzing of a bee. And, in the most hurtful rebuff, she ignores Eun-sung when the latter greets her in the morning. I’m not surprised by Grandma’s coldness toward Eun-sung. After all, her granddaughter is weeping her eyes out and refusing to eat. To be completely neutral would be asking too much. But what alarms me is what happens after the family finds out from Jun-se that his feelings are one-sided and it isn’t Eun-sung’s fault. Grandma’s erratic response is befuddling. On one hand she tells Eun-sung that she doesn’t hate or blame her. It’s so sudden, she says bemusedly, a love triangle between two granddaughters and a man. If Eun-sung hurts Jung deliberately, of course I will kick her out, but this isn’t the case. Eun-sung did nothing wrong, it’s Jun-se who likes her. I brought Eun-sung back as my adopted granddaughter and I want to do what is right for her. On the surface her words seem reasonable enough, spoken like one who is impartial and principled. But underneath is an elderly lady who values blood ties above all else. She will kick Eun-sung out if she hurts Jung on purpose? 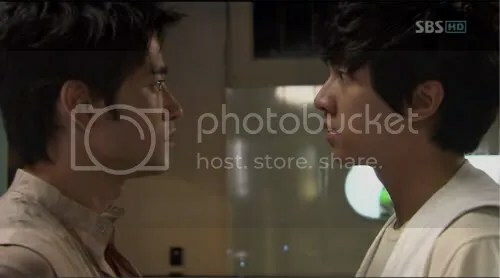 What if the tables are turned and it’s Jung hurting Eun-sung? Would she kick Jung out? And what if Eun-sung feels the same way about Jun-se? Grandma’s contradictory behavior must be hard on the actress playing her. For the first time I find Ban Hyo-jung’s acting unconvincing. She’s brusque to Eun-sung on the phone and then a short while later she reverts to her usual warmth when they meet at home. Why the bipolar moods? It’s unreal. Even though Grandma is kind to her again, I believe Eun-sung will not easily forget her abrupt coldness earlier. What guarantee is there that she will not do the same thing in the future? Can Eun-sung trust her like before? But before we go on to Eun-sung (and Hwan! ), we need to revisit the end of Episode 14 where Hwan has found that old photo of Seung-mi and Eun-sung together. SEUNG-MI: I swear to tell the truth… with some embellishment. Episode 15 begins with Seung-mi furiously treading water, trying to stay afloat. I have my reasons for hiding the truth from you (T). Eun-sung begged me not to tell because Grandma treats her as an orphan (F). Moreover, our relationship ended when my stepdad died and Eun-sung insisted that we remain strangers (F). My stepdad left behind a pile of debts and the debtors came and evicted us (T). Eun-sung saw it all and she took Eun-woo and left (F). Mom gave her money for rental, but she lost it and she lost Eun-woo as well (T). Mom persuaded her many times to leave your house but she refused to listen (T). My poor mom, twice widowed (YR). How could I tell you the truth when that would rob my mom of the little dignity she has left (YR)? I want to be able to hold my head high in front of you, but now I feel ashamed and sorry instead (DMMTL). Instead of choking, I am transfixed by Seung-mi. Wow, has she been secretly taking acting lessons in preparation for this day? 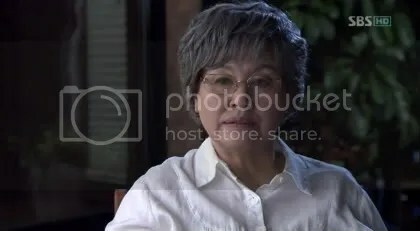 How else to explain her instant concoction of truth and lies, skillfully packaged to convey a picture of filial piety and forbearance, a Seung-mi who is a victim of circumstances and her stepsister’s schemes? So persuasive is she I had to scrutinize her speech line by line to differentiate fib from fact. Hence the T/F notes above. If this scene had transpired twelve episodes ago, Hwan would have lambasted the absent Eun-sung. But no longer. Instead he says calmly: No matter what, he is still your stepdad and this isn’t something that can be hidden. At the right opportunity, please tell Grandma the truth. But Seung-mi isn’t done with her acting. I want to go home. Your eyes suggest I’m a liar. And then, in a most dramatic gesture, she tears up the movie tickets. Hey, pull the I’m-so-hurt-that-you’re-doubting-me stunt. Make Hwan feel bad. Except that it isn’t acting anymore, because the Seung-mi who goes home is frightened and wretched. She and Hwan aren’t really dating and there’s no telling if knowing her background would scuttle any interest he has in her. The witch comes home, all flushed from a date with Jun-se’s dad where she has learned that Hwan can seek legal recourse to recover part of the inheritance from Eun-sung. That means he won’t be penniless! But Seung-mi proceeds to fling a wet blanket over her mom. Hwan knows the truth, he saw the photo. WHAT? And how did you explain it? What do you think? If it were you, what would you have said? Ahh. You have passed with flying colors, my darling. Welcome to the LTYT* Club. Our founder of the LTYTC soon learns, erroneously, that Eun-sung and Jun-se are dating. And, joy! that Grandma is upset with Eun-sung. And later, yikes! that Grandma is no longer upset with Eun-sung. The ding-donging is enough to make a witch pull her hair out. HWAN: But both of them do not seem to be liars. I began Brilliant Legacy not knowing a thing about Lee Seung-gi. But with every episode I’ve found his character more endearing. I even like his hair now; it’s the quintessence of being a Hwan. When I see Jun-se being playful with Eun-sung, I can’t imagine Hwan behaving the same way. He’s gotten quieter, more serious, more self-conscious. And somehow, in the process of changing, he’s become funnier. He makes me laugh, not because he’s intentionally comical, but because he is so unaware of how transparent he is. And the more I laugh, the more I love his character. There, the L word. I’ve used it on our former royal jerk. His clothes crack me up. See that tiny heart in the corner of the big heart? Isn’t it adorable? And look at this scarf. Doesn’t it match that skullbone sweatshirt that he wore on that run in Episode 14? Haha! After hearing Seung-mi’s sob story, Hwan is again standoffish with Eun-sung. Things at home are also a mess. He’s pleased when he hears from Jung that she and Jun-se are getting hitched because that means Eun-sung and Jun-se can’t be dating. But later he sees his sister’s devastated state after Jun-se’s rejection and learns that Eun-sung is the reason. Stop it! Aren’t you ashamed? Don’t you have any self-respect? Why reason with her when the one you should reason with is Jun-se? He says he doesn’t like you! What is Park Jun-se anyway? If he doesn’t like you, just ignore him! Is he the only man in this world? Don’t think about him anymore, just forget him completely! You know what I think is sad about Hwan’s outburst? Because now it seems Eun-sung and Jun-se are indeed dating. Because it pains him if they are. Because he really is yelling at himself: Is Eun-sung the only woman in this world? Stop thinking about her! It’s so obvious that Hwan is falling in love with Eun-sung. You’re dating Jun-se, aren’t you? Although your personality ain’t that great, I think you aren’t a bad person. 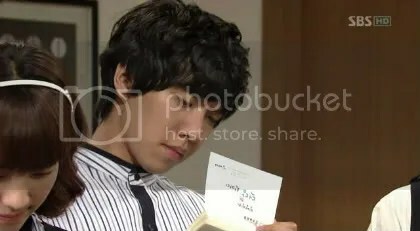 Hwan will later learn, by comparing the handwriting on the card with Eun-sung’s handwriting in her notebook, that it is Eun-sung who wrote the card to him. So he isn’t a bad person in her eyes. That knowledge pleases him immensely. But what about all the things that Seung-mi said about Eun-sung? Now he’s confused again. But increasingly his doubts don’t matter. The two are practically inseparable during the day, going everywhere to promote the 30th anniversary celebration. At first ordered to go together so that Hwan can understudy Eun-sung, they now assume any outdoor work has to be done with each other. At a community home for the elderly, an unusually animated Hwan holds court over a group of old ladies. As Eun-sung stares at him in wonder, he has the grandmas in giggling fits as he describes the anniversary lunch where anyone over 65 eats for free. Hey, he chides one sweet old lady in jest, you don’t qualify! You look like you’re only 45 years old! I lived with my grandma all my life, of course I know how to relate to old people! It’s your fault that I’ve been grouchy to Grandma. Your presence in our house makes me bad-tempered. There’s no reason for me to hate you since it isn’t your fault that you are getting the inheritance. You might think poorly of me now because of your brother, but I didn’t break your handphone on purpose. So let’s forget all that and be more professional toward each other at work. In short, a truce. A cryptic admission of how she’s affecting him and that he can’t keep up the cold facade. A plea for her to regard him more positively. EUN-SUNG: Until I find Eun-woo, I can’t plan for my own future. How uncanny. How telling the two housemates’ connection even when apart! After cooking the steak bibimbap for Jun-se, Eun-sung waits anxiously for his verdict. I can’t believe how nervous I feel, she says with a laugh. After dinner, as they are strolling outside, Jun-se tells her that he wants to be her man. Unless she’s completely dense, which she is not, Eun-sung would have seen it coming. Yet when he finally confesses his feelings, she is momentarily tongue-tied. What can she say in response that will not hurt him? I’m sorry. I know I owe you too much. I’ve been receiving brazenly from you, yet have turned a blind eye to your feelings. I thought you would understand my situation. Before I find Eun-woo, there’s nothing I can do. Obviously disappointed, Jun-se manages a wry smile and says, I knew you would give me that answer. I just wanted to be honest with myself and with you. Until you are ready, the place next to you is mine, all right? You might need to wait a long time, she replies. Earlier in Episode 15, after that exhilarating bike race, Jun-se tells Eun-sung about Hwan’s past. Don’t think of Hwan as a bad person, he says. Hwan’s dad died in an accident when Hwan was only seven. No one else saw what happened except Hwan, and it traumatized him so much he stopped speaking for three months. After that he lost all recollection of the accident and has never spoken of it. Don’t think of Hwan as a bad person. Those words will sink deep roots into Eun-sung’s mind. As she tells Hye-ri (with fondness in her voice), Hwan really isn’t a hateful person. In fact his behavior has been unusual lately, as if he’s becoming more sensible. Still, even if she’s showing more concern for him at work and at home, and even if their bath times seem more synchronized (and their attire and way of walking more alike! ), it still isn’t clear if Eun-sung has developed deeper feelings for Hwan. On one hand she tells Jun-se: If my situation isn’t this way, who knows I might even be the one chasing after a person such as you. On the other hand she seems to be studying Hwan more, looking at him in a thoughtful way. Some people fall in love at first sight (like Jun-se for Eun-sung). Some people fall slowly (like Hwan for Eun-sung). And some people get suddenly jolted into an awareness of the other person. I think our Eun-sung falls into the last category. JUN-SE: Is it because of Eun-sung? HWAN: Yes, it’s because of Go Eun-sung! It is finally the day of the second branch’s 30th aniversary. The restaurant is packed, all their promotional efforts paying off. Seung-mi has come to help, as have Jun-se and Hye-ri. Everyone is absorbed in their tasks, some even multi-tasking (like Seung-mi who’s serving as cashier and also keeping a close eye on Hwan). The joy on their faces is palpable. This is what Grandma has slaved thirty years for: her staff serving their customers with pride; her customers tucking into their food with gusto. When Eun-sung tries to clear an overladen tray of bowls, Hwan moves over to help but is beaten to the deed by a speedier Jun-se. It doesn’t make for a happy Hwan. A sharp-eyed Seung-mi notes it all. Obviously tired, Eun-sung takes a break on the rooftop and falls asleep on a bench. Along comes Hwan. Do I love the scene? Yes, yes, YES! Hwan is his rival for Eun-sung’s heart. Business closes for the day and Eun-sung announces that takings have increased by more than fourfold. The anniversary is a resounding success and a celebration is in order. So off they go, for some grilled meat and soju. Next stop after dinner is the noraebang (karaoke room). 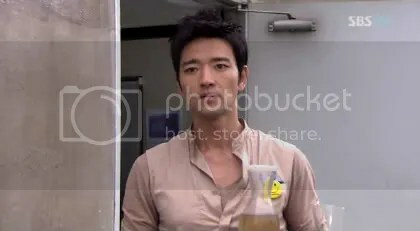 Eun-sung is asked to drink, but Jun-se does it on her behalf, downing more than he should. Then they start to sing and Jun-se holds Eun-sung’s hand. He even puts both his hands on Eun-sung’s shoulders, something he has never done before. Hye-ri comments innocently: You two look so good together. Hwan overhears and his face, already moody, turns a darker shade of black. So he takes Seung-mi’s hand (and he does it in his usual gentle way, like a cop about to handcuff a felon) and leads her to the front. As he croons away, Hwan keeps looking at Eun-sung. Jun-se seems happy (really happy) to see Hwan and Seung-mi singing together, but Eun-sung looks uncomfortable. Everyone (well, four out of the seven there) tries to appear like they are having loads of fun. As they sing, Seung-mi wraps her palm possessively around Hwan’s hand. He glances back to see if Eun-sung has noticed. Eun-sung catches Hwan’s glance and quickly pops food into her mouth, like a chipmunk prepping for winter. Everyone smiles warmly. When a pot full of soup is left on the stove, covered and unattended, pretty soon its contents will boil and overflow. Its lid might even fall off, pushed from within by the bubbling soup. It’s the same way a volcano erupts. Thus it is no surprise that the tension of the evening, the strain of keeping up appearances, should finally spill over. Bumping into each other outside the restroom, Hwan makes a sarcastic remark about Jun-se liking volunteer work so much he neglects his own cafe in order to spend the day at the second branch. Jung is ill at home because of you, so what are you doing here (touching Eun-sung and all)? Aren’t you acting out of line? Jun-se remains calm despite Hwan’s innuendo. But then Hwan starts raising his voice, so Jun-se decides he has to stop playing nice. Why are you so worked up? Is it because of Eun-sung? You’ve never shown any concern for your sister, so stop using her as an underhanded excuse to blow your top at me! Just say what’s in your heart. You care only about yourself, so aren’t you mad with me because of Eun-sung? What follows really shouldn’t have happened. Hwan could have just answered Jun-se’s question, which he does, later. Instead his first reaction is to draw blood. Hiding behind a wall, too afraid of the ongoing altercation to reveal herself, Seung-mi hears and sees everything. The guys shouting at each other. The younger one punching the older. The younger confessing why he is angry. What Seung-mi has vaguely suspected is now confirmed. Her Hwan is in love with Eun-sung. Hi colleagues, pleasant paragraph and nice urging commented here, I am truly enjoying by these. I’m hoping to give a contribution & assist different customers like its aided me. Great job. Hill Psychiatric Hospital in New Canaan, Connecticut. Hey very nice web site!! Man .. Beautiful .. Superb .
. I’ll bookmark your site and take the feeds additionally? I am glad to find so many helpful information right here in the post, we need work out extra strategies in this regard, thank you for sharing. . . . . . It iis the little changes that wipl make the most significant changes.